Sometimes good things come in pairs…and sometimes they just double up. 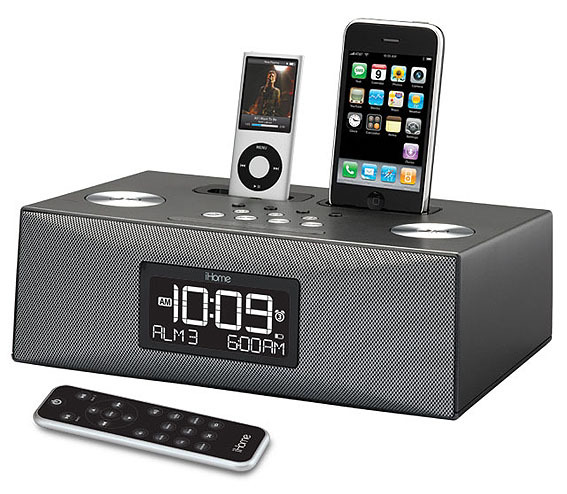 Accessory and peripheral maker iHome has introduced its new iP88 iPod/iPhone alarm clock/radio, which not only offers two separate alarms, but also sports two separate iPod docks so users can charge up and access audio on two separate iPod/iPhone decides. The iP88 aims at folks who find themselves using both an iPhone and an iPod, as well as at Apple-carrying carrying couples who have a pair of devices between them—it has a distinctively boxy look, but that may be just the thing for tucking onto a nightstand or into a bookshelf. The iP88 features dual universal docks that work with any docking iPod model as well as the iPhone and iPod touch; of course, iPods and iPhones get charged while they’re docked. Users can set alarms to trigger the AM/FM radio, play a playlist from either an iPod or iPhone, or wake up to a traditional buzzer. The unit also also features a graduated volume setting for waking folks—or putting them to sleep—gently. The unit can handle 8 AM/FM presets, and features a line in jack to accommodate non-iPod media players. 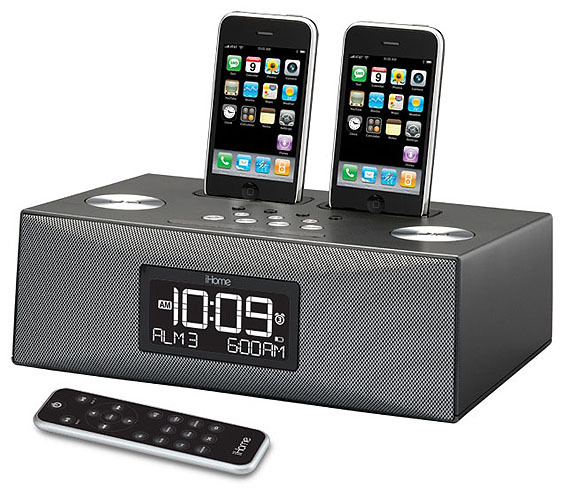 The iP88 ships with a remote control, and users can also sync the iP88’s clock to their iPod/iPhone time with the touch of a button. The iP88 is available now for a suggested retail price of $149.99.